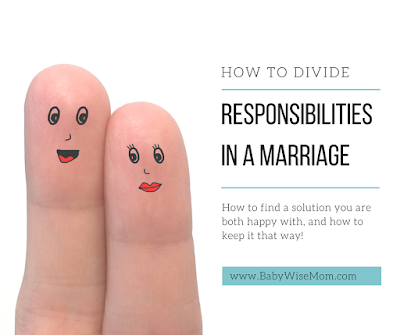 How to Divide Responsibilities in a Marriage. 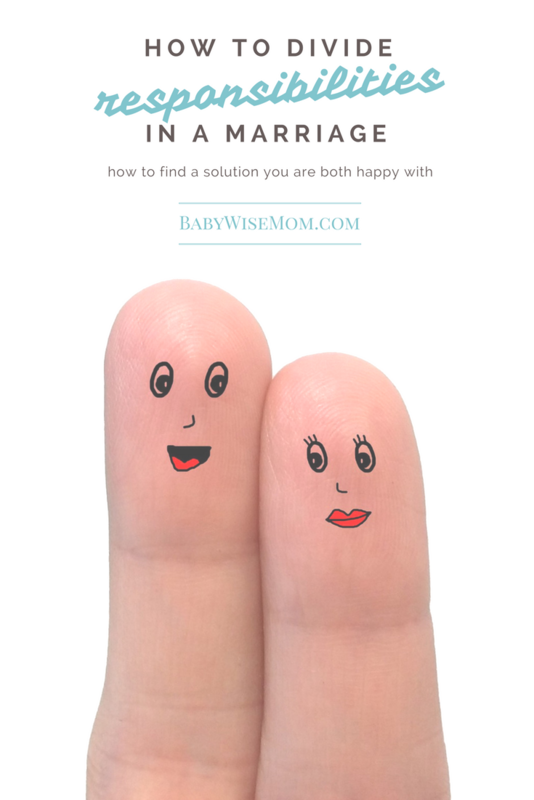 How to find a solution you are both happy with and how to keep it that way! Seven steps to take to get on the same page. 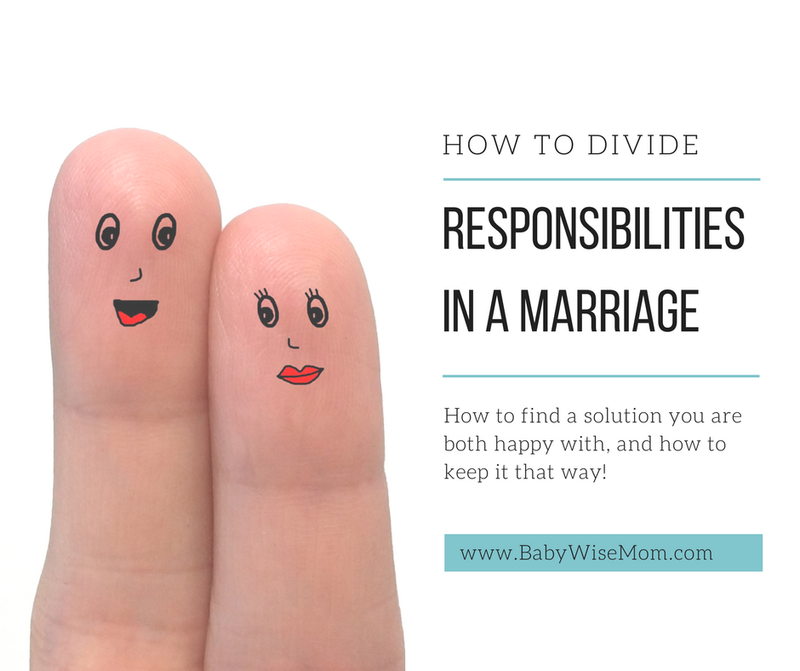 Chances are high that when you came into your marriage, you and your spouse had different views of exactly how to divide labor in the home. Who is in charge of cooking? Cleaning? Dishes? Diapers? Laundry? Garbages? The list of household chores is extensive, and once you add children to the mix, there are even more responsibilities to be added to the daily list. The question is, how will you divide responsibilities? Someone needs to be in charge of each thing. Even if you are both all on board with an idea of “everything is both of our jobs,” you need someone to take point. That’s nice if you are both willing to cook, but there needs to be order or else you will both be planning meals (and possibly even taking steps to prep) or you will both be waiting around for the other one to get started on dinner. Maybe you both cook each meal? Maybe it varies from day to day depending on what is going on? You just don’t want to end up with resentment because expectations are not expressed. Oftentimes, our expectations for who will do what is shaped by what our parents did as we grew up. We might want to emulate what they did, or we might want to radically change what they did. Sometimes we are raised differently than how our parents did things. My husband is an example of this. His father was raised in a home where traditional roles were kept. His father continued that on as my husband grew up (though that has changed by today). His mother, however, was raised in a home where her father contributed extensively to household duties, which was rare for the era. She raised my husband to be an equal contributor at home, and he always has been. People can have strong opinions about how responsibilities should be divided. Some couples are happy in a fully traditional setup. Some are equal. Others do some sort of hybrid and even an ebb and flow where things can shift as circumstances change. While you might think there is only one right way, there really isn’t one right way for everyone. 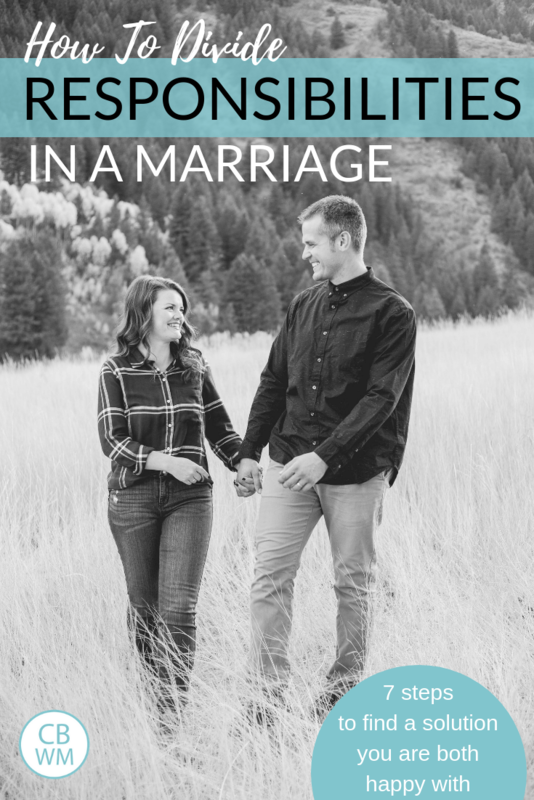 What is important is that both people in the marriage are on the same page and willing to compromise to come to a consensus so that both people feel satisfied with the arrangement. You must communicate about the division of responsibilities. You may have grown up in a home where your father emptied every garbage in the home and you feel fully offended that your husband leaves garbages for your hands to touch at times, but he doesn’t know that if you don’t share that. You both need to talk about what you prefer as you divide responsibilities. Write down what needs to be done and talk about who will be the main person in charge of those things. Be frank about if/thens, also. My husband knows that if he does the dishes after dinner, I am going to make more elaborate meals. If I am making dinner and then cleaning dinner up, what we eat will be heavily influenced by how many dishes I have to dirty. My husband loves food, so he is happy to take on the dishes. If you spend your time more concerned for your spouse than yourself, you will find yourself much happier. Rather than grumbling because your life is so hard, think of how you can make your spouses life easier. When you see a need, fill a need. Don’t think, “Not my job! Not my problem!” If you are more concerned for your spouse than yourself, then you will see a need and do what you can to fill it. Life isn’t going to be 50/50. It just won’t. If you keep track of how much more you do around the house than your spouse, you will live very miserably. When your husband is working longer hours than usual, step up and help cover things he usually does. When your wife just delivered a baby, step up and cover some of her usual responsibilities. Also, as your children get older, use them! With my husband building an addition on our home for almost the last year, my children have had to step up and take on more household responsibilities. It has been great for them to contribute to the home more. If your spouse is a rockstar and takes on some of your jobs while you are stressed, step back in to those jobs when things calm down, or take on some of his jobs. Don’t leave him overburdened, or he will likely be hesitant to step in and help next time. A cute older woman in my church once warned me, “Don’t take on anything that he does unless you want to do it forever.” Sage advice! Advice based on observation and real-life experience. We do that, right? Someone does something nice for us and we step back, dust our hands off, and think, “Whew! Got that one off my plate!” Remember, see a need, fill a need. Look, working outside the home is rough. Sure. That doesn’t mean when you get home, you get to be “off.” Being a stay at home parent is never-endingly exhausting. Yes. That doesn’t mean when your spouse gets home from work that you are now off duty. You both need to help when you are both around. Sometimes one of you will need a break. You will need a night out every so often or even just someone to box out when the kids try to talk to you in the bathroom. We all have our days when we just need a moment. We don’t need every day, though. We might want every day, but we don’t need it. Many hands make light work, so help each other out. See a need, fill a need. When my husband and I first got married, I had total control over the finances. I did the budget, I paid the bills, and I knew where our money was. This was a great thing at the time. While we are both frugal, I am even more so than he is. By a lot, really. He lives life more spontaneously while I am always planning and preparing for the future. We were both going to school full time and working part time, so we didn’t have a lot of money. It was good for me to be over the finances. When Kaitlyn came along, I had two children under the age of two, and keeping on top of the bills got overwhelming for me. So my husband took over. This was a great move at that point in our marriage. It helped him be more aware of the state of our finances, so he was more conscientious about what we spent where. I was not always the “no, we shouldn’t spend money on that” person. He got more frugal. It helped me relax some on spending money. By that time, he had a real job so it was a good time for me to relax. It also helped bills be paid on time, which is a plus! My point is, as life changes and circumstances change, mix up who is responsible for what. As you get to know each other and yourselves better, mix up who is over what. Play to your strengths to make a strong team. Nothing needs to be set in stone. When we have a nursing baby, I am the one who puts the baby to bed at night. As soon as the baby turns one and is weaned, my husband takes over bedtime for that little one. We do this so that he can get some good, quality time with that child each day. He works full time, so while I spend all day every day with the little one, he has only hours. I have a couple of naptimes to do, so I get plenty of opportunity for the cuddling and reading stories. Being in charge of bedtime for that child helps my husband form a bond with that little one. One of the best tools you will have as you divide up responsibilities in marriage is to communicate. Talk. Share your expectations, hopes, likes, and dislikes. Listen to his. Find something that works for both of you. Keep those lines of communication open and talk about changes that might need to be made as they arise.